Great spots for camping and glamping on JejuJeju has a ton of excellent spots for camping and glamping, here are some of them. Jeju has a lot of excellent spots to go camping. The coast is especially popular and many of Jeju’s larger beaches have dedicated places to pitch a tent. Inland spots are a little harder to find although with the amount of beautiful countryside on Jeju there are still plenty of sites available. However, what if you don’t have a tent? Alongside the rise of camping, glamping has also become hugely popular on the island. For those that don’t know, glamping is a portmanteau of glamor and camping. It is an activity that allows people to combine many of the best aspects of camping, such as being close to nature, with some of the home comforts many people miss when camping. Of course, its other major advantage, especially when traveling to Jeju from another country or the mainland, is that you don’t have to bring a tent with you yet can still have a camping experience. 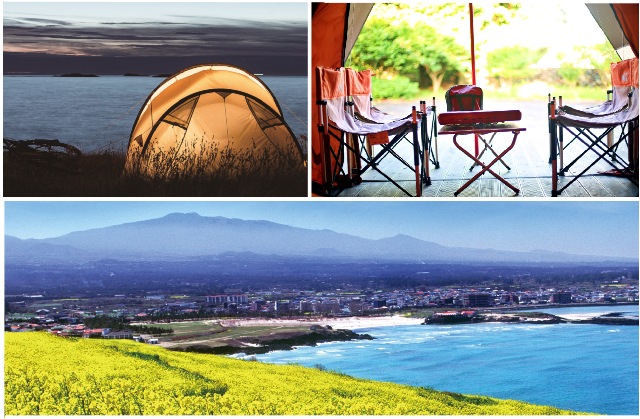 Here are some of the best spots for both camping and glamping during your vacation on Jeju. Gyorae Natural Recreational Forest Camping Site is a camping site situated within one of Jeju’s Gotjawal forests. Campers can choose to either simply camp on the grass for 2,000 won or can rent an additional deck for 6-8,000 won. The buildings within the site are designed to look like traditional Jeju thatched roof houses and this is complimented by the traditional Batdam black stone walls that are found throughout. As it is situated within the forest, the campsite is also connected to a host of walking paths that go through the forest. Dolharubang Campsite is surrounded by countryside and situated on the west side of Jeju. The main site is a large grassy area where children can play. One of the main attractions is the fact there is a small swimming pool within the campsite grounds. If you don’t have a tent you can also choose to rent a bungalow. Price per night: 25,000 won during the offseason and 40,000 won during the peak season (July and August). Firstly, the beach itself is spectacular. The white sand is some of the purest on Jeju and the seawater is some of the clearest. This all combines with views of Biyangdo Island and Jeju’s black volcanic rock formations to give a view that is unique to this part of Jeju.While many of Jeju’s beaches have spaces dedicated for camping, the campsite at Hyeopjae Beach is perhaps the best of the lot. The campsite itself is situated just behind a stretch of sand that is slightly west of Hyeopjae Beach. This is away from the crowds found on the two main strips which make it the perfect place for a relaxed evening in the sun. There aren’t many facilities on offer and you aren’t allowed to cook at the site but there are plenty of restaurants nearby if you get hungry.The campsite at Pyoseon Beach is about as basic as it gets, however, it’s completely free and with the views on offer it is still an incredible place to go camping. The site itself is situated on the southern side of the beach and is a flat grassy area surrounded by trees. Address: 44-1 Pyoseon-ri, Pyoseon-myeon, Seogwipo, Jeju-do. Hamdeok Camping Star Caravans are caravans based right next to Hamdeok Beach. Hamdeok is fairly close to Jeju City, and its turquoise seas and views of Seoubong Oreum make it one of the most beautiful beaches on Jeju. The caravans all come with everything you could need for your stay including a bed, table, bathroom, and even an outdoor deck where you can have a BBQ. Price per night: 69,000 to 169,000 won depending on the caravan type and time of year. Located in Cheonjeyeon Waterfall Park, it is an eco-friendly campsite surrounded by the sound of the forest, birds and the waterfall.Jungmun Jinsil Camp Site is a great spot due to its accessibility to the nearby tourist attractions found in the Jungmun Resort, as well as the beauty of the surrounding landscape. There are 26 tent facilities, all of which have decks as well as comfortable bedding, and access to a shower room with hot water, cooking facilities, and other amenities. Furthermore, basic equipment such as portable pots and pans, tables, chairs, portable gas stoves, pillows, lanterns and equipment for a grill are all provided to help you have a barbecue party. Situated in the hills of Aewol, Eco Hill Camping has a pool to ensure that you don’t miss out on your morning swim even though you aren’t at the beach. Tents are available in either couple or family sizes and come with everything including beds, a tv, table and chairs and even air conditioning to ensure your stay will be as comfortable as possible. Price per night: 70,000 to 240,000 won depending on the tent size, day, and time of year. Jeju Glamping is a full-scale glamping experience on the eastern side of Jeju. It has everything a glamper could want including a large play area, restaurant, shops, and a swimming pool. There are two types of tent available, each one can fit in up to four people which, considering the facilities available, make it a great place for families to enjoy a camping vacation without any of the hassle associated. Its location is fairly remote but people who choose to rent a car will easily be able to access some of Jeju’s most famous sites such as Sunrise Peak, Udo Island, Manjanggul Cave, Weoljeong Beach and more with relative ease. Price per night: 200,000-300,000 won depending on the tent for two people. There is an extra 20,000 charge per person up to a maximum of four people.